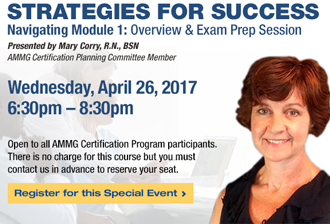 Open to all AMMG Certification Program participants. This free interactive two hour course is designed to help participants prepare for the Module 1 Examination. Study materials will be covered and challenging areas will be identified as participants will learn necessary resources to help navigate them successfully. There is no charge for this course but you must contact us in advance to reserve your seat.